Apple computers are known for their aesthetic appeal and ease of use directly out of the box. However, with the last several software and hardware updates, Apple has continuously upgraded and improved the ease of usefulness of its multi-touch gestures. Since I switched to a MacBook Pro nearly two years ago, I have been completely enthralled by Apple’s Multi-Touch Gesture UI. My wife’s Toshiba laptop is dead to me. My Lenovo work laptop is nearly too cumbersome to operate. While Windows-based laptops are beginning to catch up, there is still no experience that is quite as satisfying as using a Mac’s track pad. There are a few basic gestures that a user must get used to before becoming completely comfortable with a Mac, however – this quick how-to guide should get you on your way. 1. 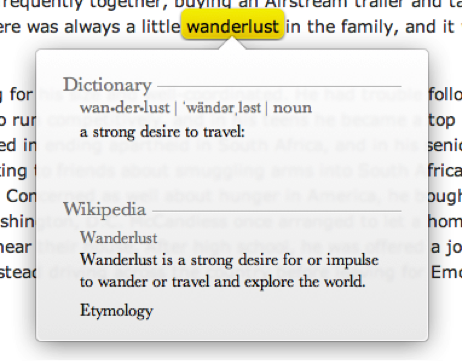 The first gesture that should be addressed is how to right-click on a Mac. This may seem base, but I know that it is one of the most frustrating things for new users. 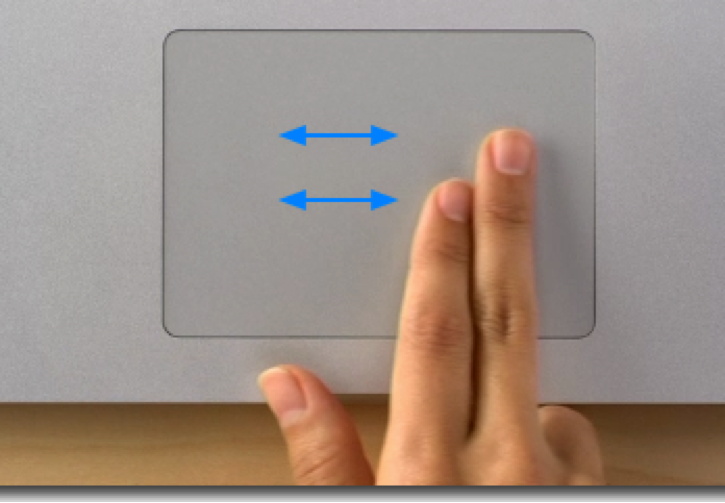 A right-click on a Mac is simply clicking the track pad with two fingers. 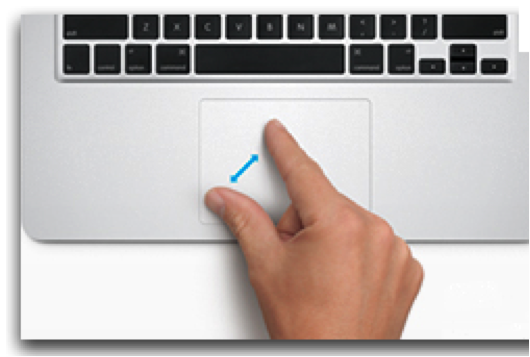 A regular left click is clicking the track pad with one finger. 2. By tapping the track pad with three fingers, a user can quickly look up any word on the screen. 3. One of the most common gestures, and one that is now adopted by several other platforms, is what Apple calls “natural scrolling.” With many applications now ditching the scroll bar, users now scroll by moving two fingers up or down on the track pad. 4. In 2013, most of us, at some point or another, have owned either a smartphone, iPod, or tablet device. Because of this, we are probably all familiar with “pinch to zoom.” Making a pinching motion on the track pad will zoom in on the page; expanding the two fingers will zoom out. Beyond the basic gestures, Apple has integrated several more useful gestures that help users navigate throughout their Mac. 5. While browsing online, you can easily move back or forward pages. Swiping right with two fingers will go back one page. Swiping left with two fingers will move your browser forward one page. 6. Apple also makes it easy to navigate between apps that require the full screen. Using the same swiping gesture that you use to navigate web pages, swipe left or right with four fingers. This will navigate back and forth between however many desktops you have open. 7. One of Apple’s most useful navigation tools is called Mission Control. Mission Control essentially shows the user every available desktop, window, notification, or toolbar. 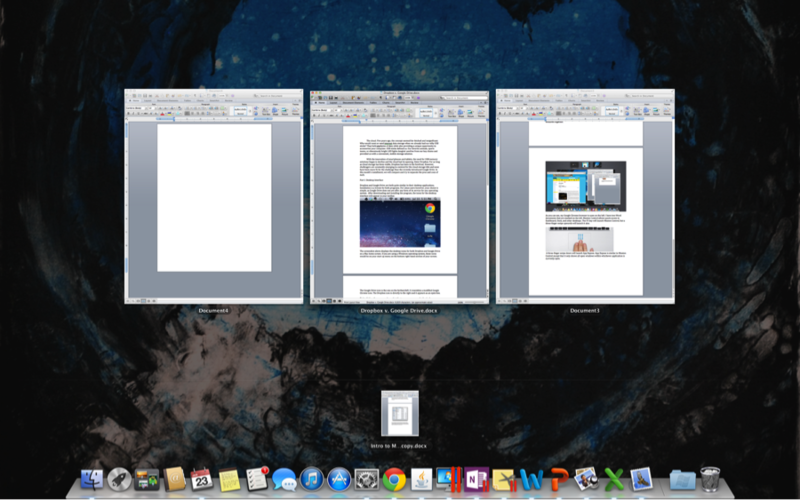 If you have a ton of windows open, Mission Control will group similar windows together. 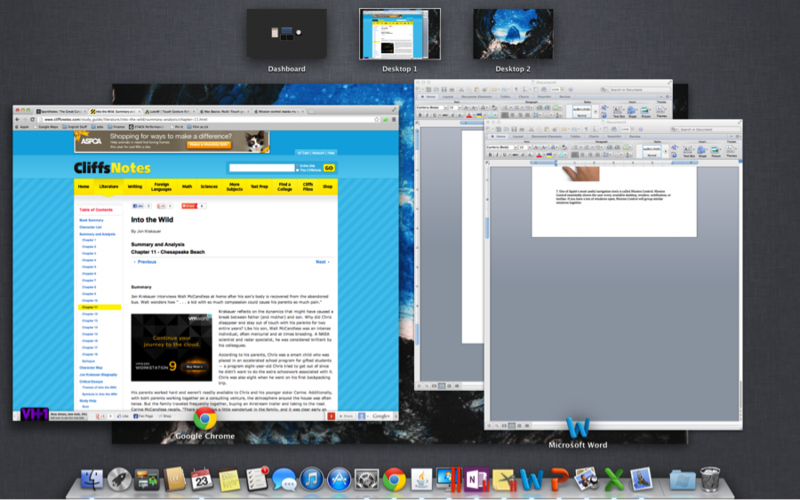 As you can see, my Google Chrome browser is open on the left. I have two Word documents that are stacked on the right. Mission Control allows quick access to Dashboard, Dock, and other desktops. Clicking on any window will bring it to the forefront. 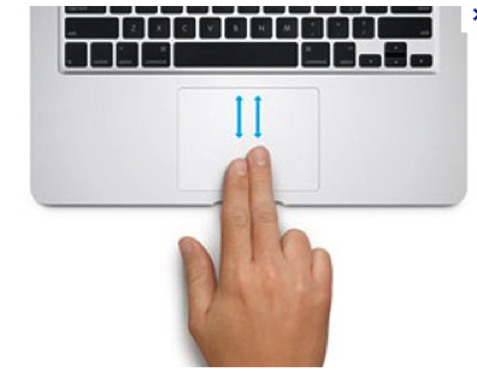 The F3 key will launch Mission Control, but a three-finger swipe upwards will launch it also. A three-finger swipe down will launch App Expose. App Expose is similar to Mission Control, except that it only shows all open windows within whichever application is currently open. 8. Launchpad would be comparable to Microsoft’s Start Menu. 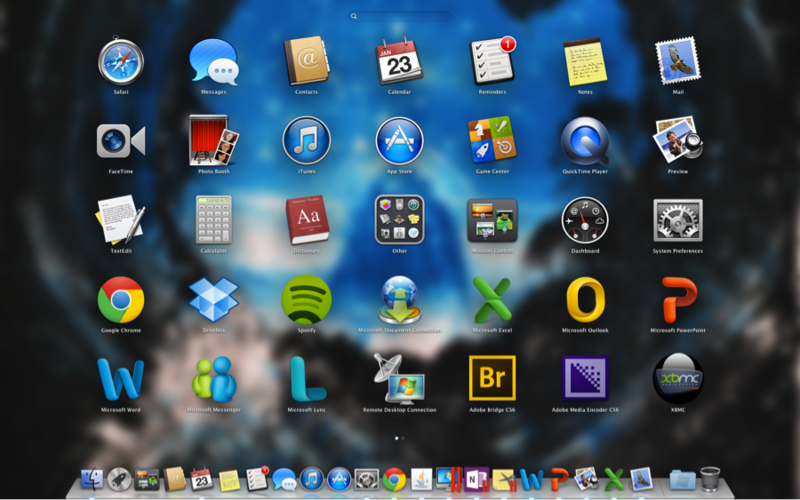 Launchpad shows users all available applications, usually with vibrant icons. There is no key that will quickly launch Launchpad, so the gesture is the only way to quickly get to Launchpad without clicking the icon on the dock. 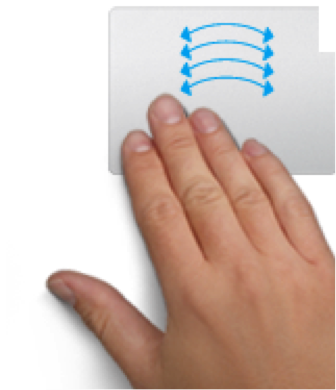 To launch Launchpad with gestures, use a four-finger pinch. Sometimes it is best to just clear the clutter on your desktop. You can do this easily without having to manually close every window. 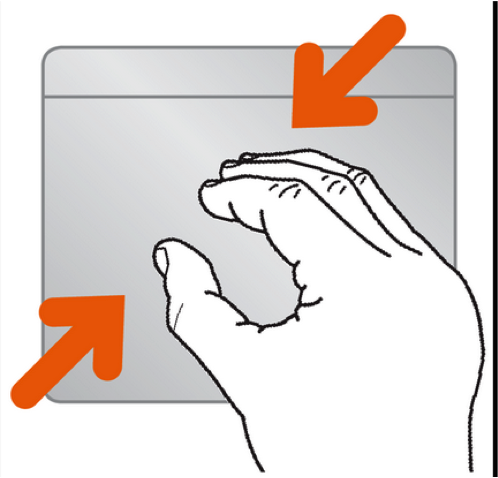 By spreading with your thumb and three fingers, you can “throw” all windows off to the side to reveal the desktop. To bring the windows back, use the same gesture that you would use to launch Launchpad, pinching with your thumb and three fingers. Note: While Apple’s built in multi-touch gestures are incredibly useful, there is third party software available that opens up your Mac’s multi-touch capabilities. Better Touch Tool (link is available here) allows users to customize their own multi-touch gestures.